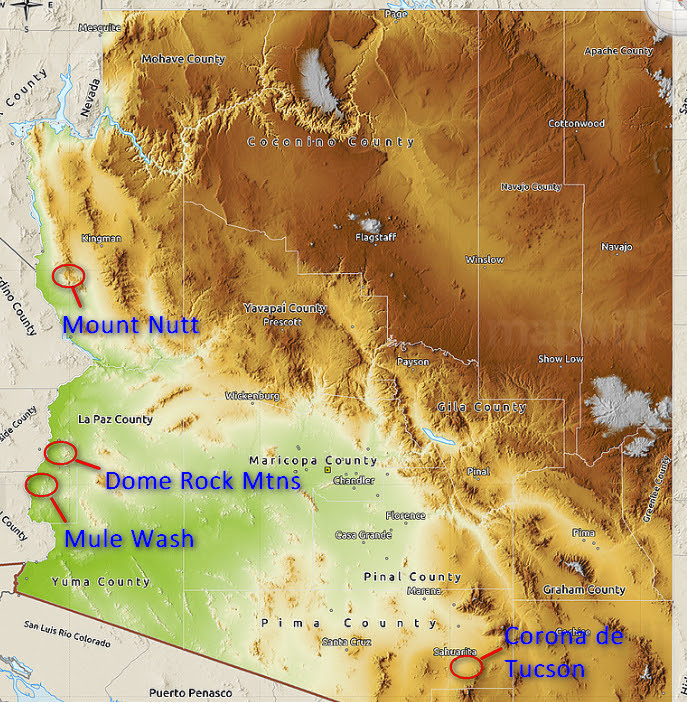 Arizona Geological Survey has released four geologic maps for western and southeastern Arizona listed maps below. Gootee, B.F., Spencer, J.E., Tosdal, R.M., Pearthree, P.A., and House, P.K., 2016, Geologic map of the Mule Wash 7 ½’ Quadrangle, La Paz County, Arizona and Riverside County, California. Arizona Geological Survey Digital Geologic Map DGM-117, scale 1:24,000, 9-p. report. Spencer, J.E., Pearthree, P.A., Gootee, B.F., and Tosdal, R.M., 2016, Geologic map of the Dome Rock Mountains SW 7 ½’ Quadrangle, La Paz County, Arizona. Arizona Geological Survey Digital Geologic Map DGM-116, scale 1:24,000, 1 sheet. Ferguson, C.A. and Cook, J.P., 2016, Geologic map of the Mount Nutt 7½’ Quadrangle, Mohave County, Arizona. Arizona Geological Survey Digital Geologic Map 118, one map plate, 1:24,000 map scale. Johnson, B.J., Pearthree, P.A., and Ferguson, C.A., 2016, Geologic map of the Corona de Tucson 7 ½’ Quadrangle, Pima County, Arizona. Arizona Geological Survey Digital Geologic Map DGM-115, scale 1:24,000.